tokyo’s calm & punk gallery will begin ‘refract!’, a new exhibition from yuichi higashionna on may 16th. the work of higashionna experiments with different mediums and questions the optical experience. this particular show features an installation that is inspired by the idea of ‘the uncanny’. 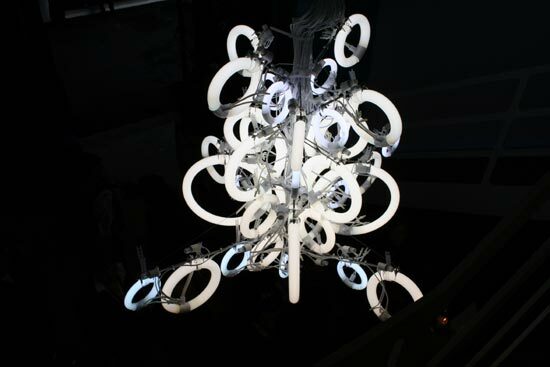 included in the show will be a new piece in his chandelier series made from florescent lamps as well as an installation made from rubber bands and pieces combining painting and animation. the artist’s first book will also be published to coincide with the exhibition. the show will run until june 5th.